The much-discussed Lotus 79 was finally unleashed at Zolder and it made a winning start as Mario Andretti took his second win of the season at the Belgian Grand Prix to regain his lead in the drivers' championship. It was a risk by team boss Colin Chapman as the Lotus 79 had only had a couple of days testing in Sweden with Ronnie Peterson the previous week. Andretti's win capped a frenetic weekend. He dominated Friday practice to take pole position, and then jumped on board Concorde to take part in qualifying for the Indianapolis 500. The previous week's qualifying had been cancelled because of rain, meaning he would have missed out had he remained in Europe. The weekend started with James Hunt being awarded the Prix Citron award by journalists for the least popular driver among the press corp, his second successive win, and he launched an immediate bid for the hat-trick when he told them the award was actually for the driver who paid the least attention to their demands. A jet-lagged Andretti made a perfect start but Carlos Reutemann, next to him on the front row, did not, delayed by a mixture of wheel-spin and a missed gear change. His slow getaway triggered a chain reaction of collisions behind him which accounted for Hunt, Emerson Fittipaldi and Niki Lauda. Gilles Villeneuve was the only driver to keep up with Andretti, and the Ferrari benefited from the leader slowing to preserve fuel. Jody Scheckter briefly threatened to challenge the pair but he was undone by ignition trouble and then he spun off. When Villeneuve pitted with tyre problems, Ronnie Peterson moved second, a position he surrendered when he too had to pit, although so efficient was the stop that he resumed in fourth and soon moved back behind his team-mate. Reutemann had battled through to take third, but as he slowed near the end he came under increasing pressure from Jacques Laffite's Ligier. On the final lap, Laffite tried to pass at the chicane and came off worse as the two cars collided. The Ferrari continued while Lafitte still took fifth as he was within a lap of the top four. "The car behaved fantastically," grinned the 38-year-old Andretti. "It made the job easy for an old man. I kept just a little in hand and knew that if Villeneuve got too close I could always pull out another second a lap." 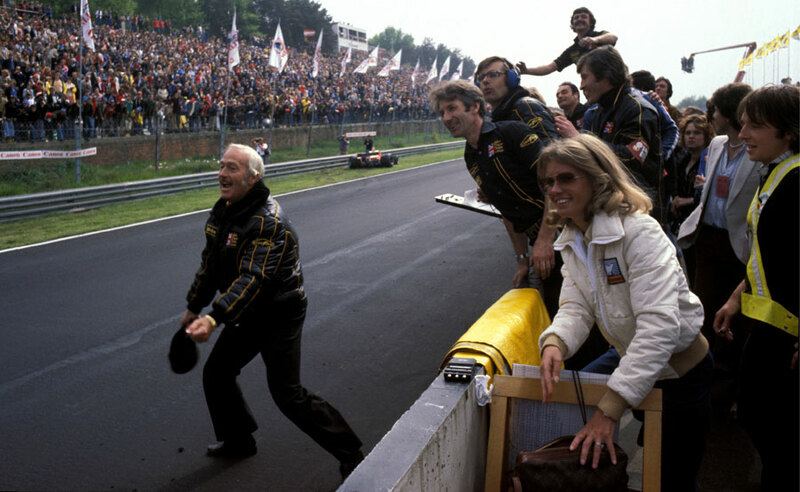 It was a perfect birthday present for team boss Colin Chapman who had turned 50 earlier in the week.